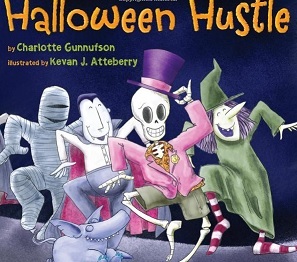 Halloween 2013 is creeping upon us, and what better way to have some spooky reading fun than Charlotte Gunnufson’s Halloween Hustle (Two Lions, 2013), featuring illustrations by Kevan J. Atteberry? Halloween Hustle is appropriate for ages 4 and up, and tells the story of a skeleton dancing his way to a Halloween party, but keeps stumbling, tumbling, and falling apart on the way. No one knows if Skeleton makes it to the party without any missing pieces until the final outcome is revealed in this book. This is a clever, delightful, fun read with clever rhyming and exquisite illustrations. This is one Halloween book parents will enjoy reading with their kids, and can make the whole concept of Halloween less scary to very young children. Halloween Hustle is a lively book I can easily see becoming a classic which parents will enjoy sharing with future generations. Where were books like this during my childhood?